The software testing services offered at iNFOTYKE. Acceptance testing – To verify that the software is ready and that it can be used by end users to perform those functions and tasks for which the software was built. Key measures of quality assurance software testing. The key measures of a test include Coverage and Quality. Test Coverage is the measurement of testing completeness. It is based on the coverage of testing expressed by the coverage of test requirements and test cases or by the coverage of executed code. Test coverage includes requirements based coverage and code based coverage. Quality is a measure of the reliability, stability, and performance of the target-of-test (system or application-under-test). Quality is based on evaluating test results and analyzing change requests (defects) identified during testing. Testing is applied to different types of targets, in different stages or levels of work effort. These levels are distinguished typically by those roles that are best skilled to design and conduct the tests, and where techniques are most appropriate for testing at each level. It’s important to ensure that a balance of focus is retained across these different work efforts. Developer testing denotes the aspects of test design and implementation, most appropriate for the team of developers to undertake. 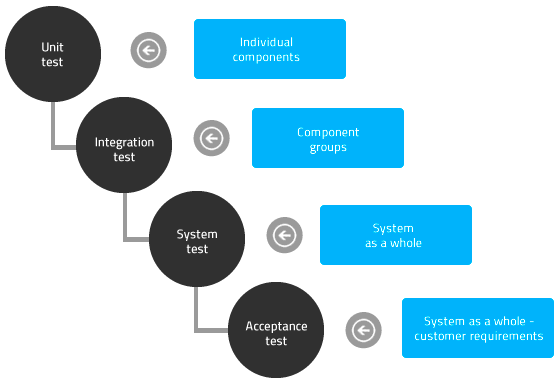 In most cases, test execution initially occurs with the developer-testing group who designed and implemented the test but it is a good practice for the developers to create their tests in such a way so as to make them available to independent testing groups for execution. Outsourcing software testing services to iNFOTYKE will enable your company to concentrate on its core business activities while our testing experts handle your software testing work.